The bathroom is located upstairs. 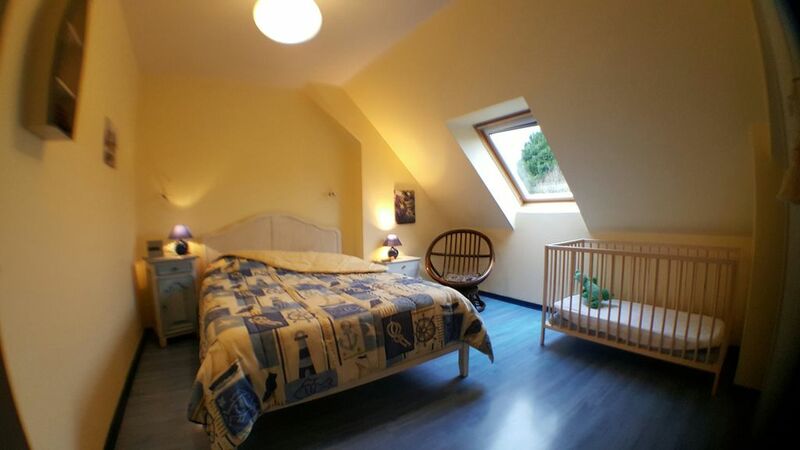 It is bright and spacious with a bathtub, wash basin built-in a storage furniture, one nappy changing table and toilet separated by a small wall. You also have a full-length mirror; a chair and tiled floor. The velux window is equipped with a grey window shade. There is also a shower room with shower on the ground floor, washbasin, mirror and shower curtain. This is very practical after the beach. South-facing terrace equipped with two beach chairs, garden furniture barbecue and sun umbrella. Accueil chaleureux et convivial. La maison est spacieuse et lumineuse et la terrasse fort agréable, car abritée. Le marché du dimanche matin est à ne pas manquer. Quartier agréable et calme. Le séjour fut très apprécié mais trop court ! Encore merci pour votre accueil. Famille Flahaut. Location conforme à l'annonce avec l'accueil chaleureux de la propriétaire en prime. En plus : terrasse-jardin très agréable avec chaises longues et table de jardin (repas à l'extérieur bien sympathiques). Gîte de qualité à recommander ! Geographical location The gite is located in a calm village 1,5 km away from a very big beach where you can take some air, swim and of course go fishing. The Contentin peninsula is boarded on three sides by the English Channel, the sea that gave its name to the department. An amazing complicity between the sea and the moon offers the most important spring tides in Europe, which give an incomparable taste to the oysters. By the way, concerning the sea, Normandy is the first producer of oysters and mussels. At low tide, the oyster parks are accessible by tractors; this is the reason why the oyster-farmers are called "sea gardeners". Bearings: La Manche: 5940 km and 330 km from the coasts Hauteville sur mer is a small beach town lively and relaxing at the same time; it is also the only station for children in Lower Normandy; so many activities are provided for children. Many efforts are also made for disabled people.